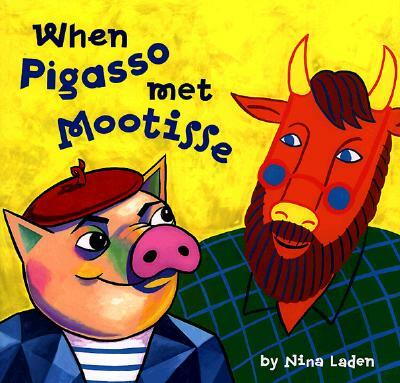 When Pigasso met Mootisse, what begins as a neighborly overture escalates into a mess. Before you can say paint-by-numbers, the two artists become fierce rivals, calling each other names and ultimately building a fence between them. But when the two painters paint opposite sides of the fence that divides them, they unknowingly create a modern art masterpiece, and learn it is their friendship that is the true work of art. Nina Laden's wacky illustrations complement this funny story that non only introduces children to two of the world's most extraordinary modern artists, but teaches a very important lesson&dash;how to creatively resolve a conflictin a most unusual way. Nina Laden grew up in the New York City area. The daughter of two artists, she studied illustration at Syracuse University. She is the author and illustrator of The Night I Followed the Dog, also published by Chronicle Books.